Both of the Berkshire League aces gave up just three hits along with nine strikeouts. Fortier issued two walks; Cormier, four, on a blustery day that turned sunshine into icy chill. “Sometimes the wind moves the ball for you,” said senior Fortier, like Cormier a seasoned veteran. “It was just as windy for them,” said catcher Harley Jasmin. Nevertheless, experience shone for the Highlanders, with all but two starters on hand from last year’s undefeated Berkshire League championship team. In a run to the Class M quarterfinals, losing to state champion St. Joseph, the veterans learned to take what was offered. Wednesday, that meant a two-out first-inning walk to Jana Sanden, followed by a drive up the middle from Jasmin. Sanden never slowed down in her race around third for the 1-0 lead. Opportunity sang again in the top of the third inning with a leadoff walk to Sydney Sanden. 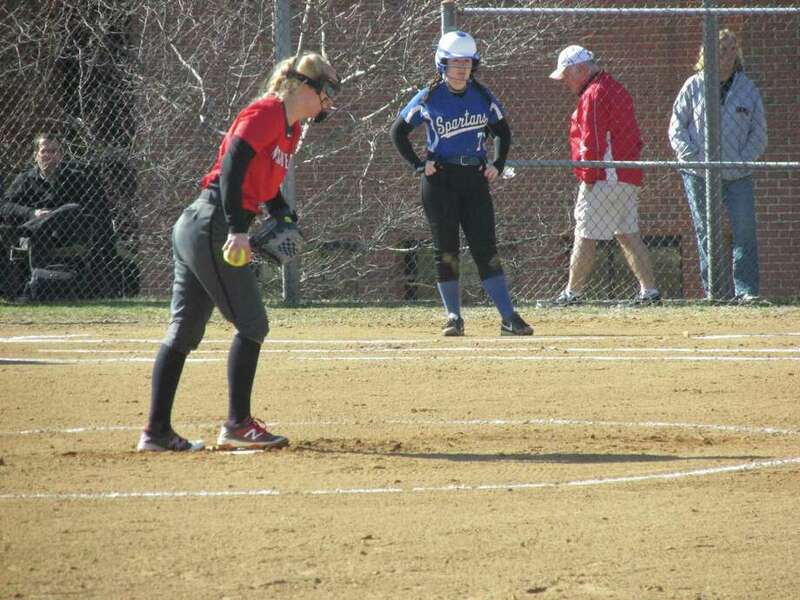 While Cormier was chalking up her fourth strikeout of the game, Sanden reached third on a pair of wild pitches. Jana Sanden scored her sister easily with a triple to left field, then sprinted home on a throwing error. “On a day like this, you just have to watch the ball and its movement,” said Jana, a year younger than senior Sydney. Three runs should have been more than enough with these pitchers throwing into the wind, but each team bemoaned missed chances. Spartan Hailey Gorack led off with a double in the first inning, then froze there while Fortier and her defense went to work. Cormier reached third base in the fourth on a single and two groundouts, only to watch Highlander center fielder Ellie Olsen make the final sure catch. A walk and a bunt had Hailey Gorack and Caitlin Curran on first and second with no outs in the sixth. Fortier and her defense cleaned the plate again. “(Cormier) has pitched great all year; we just didn’t score enough runs for her,” said first-year Mills coach Chris Sawyer, who offered private hitting lessons in the area after an eight-year minor league career in the independent leagues. Northwestern had a chance for another big inning after two Mills errors put the Sanden sisters on first and third in the top of the fifth. Cormier left them there. “I wish we had more hits, but we’ll take the win,” said Highlander coach Stacey Zematis. Mills, one of the pre-season favorites, along with Northwestern and Wamogo, is 2-2 after a tough loss to the Warriors last Saturday. Northwestern is off to another 2-0 start. WP: Lexi Fortier. LP Mary-Kate Cormier. 3B – NW – Jana Sanden. 2B: LM – Hailey Gorack. Records: Northwestern 2-0; Lewis Mills 2-2.